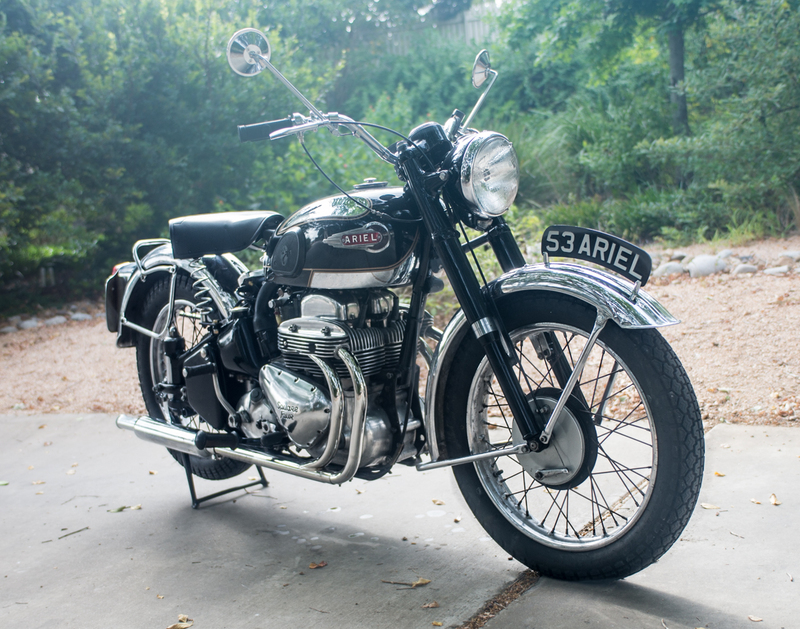 Although Ariel produced quite a variety of single and twin cylinder bikes, my attention has always been drawn to the Square Four. Boasting a very unusual “square” cylinder arrangement (2 each side by side, front and rear), the first Square Four model was a 500cc unit introduced in 1931 with innovative overhead cams. then in 1937 engine capacity was doubled to 1000CC where it remained until the company’s demise in 1959. 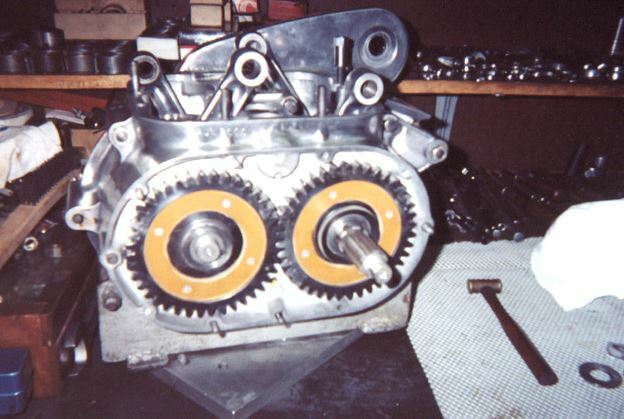 In an era where most British bikes were vertical twins, almost all of which had both pistons moving together (with the expected vibration), the Square Four was an innovative design. Each piston had its own crank throw, resulting in smooth, even, alternate firing of the 4 cylinders and a very smooth ride. 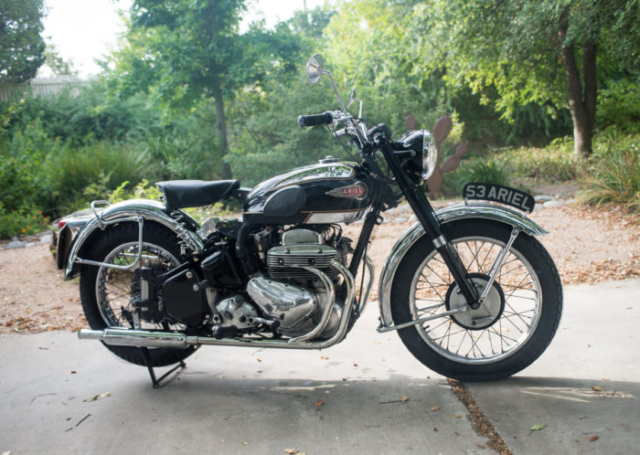 The 1,000cc engine was by no means a powerhouse by today’s standards, producing about the same horsepower as the Triumph 650cc engines of the same era, and roughly identical to the now-much-sought-after 1000cc Brough Superior motorcycles of the 1930’s. 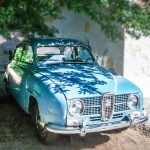 But considering that the basic engine design dated back to 1936, it offered respectable power and gobs of low-end, vibration-free torque. 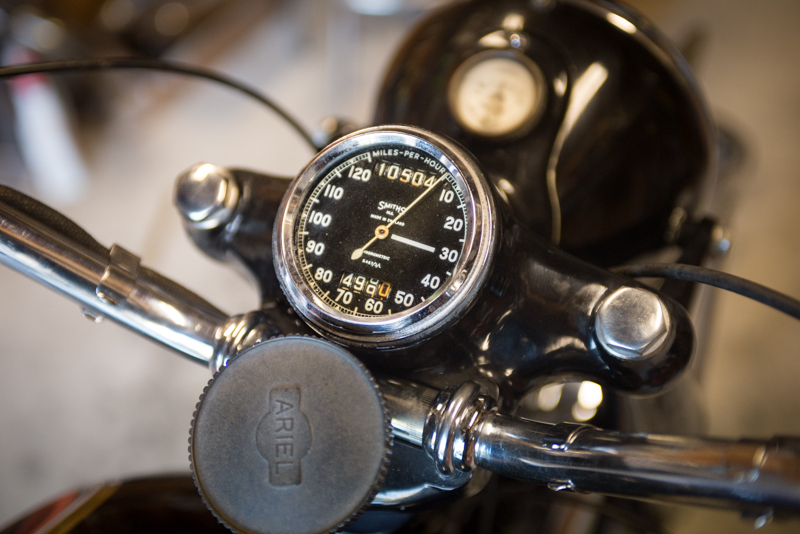 In fact, enough power to propel the bike and its rider to the much desired “ton” (100 miles per hour). A leisurely 6.0:1 compression ratio insured that premium grade fuel would be unnecessary. 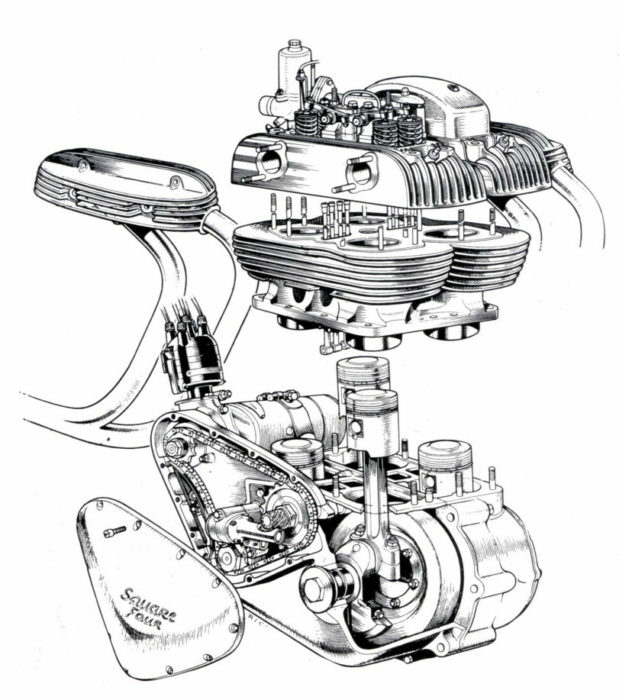 A single carburetor (either Solex or SU) fed all 4 cylinders.. not the most efficient induction design for optimum power, but nevertheless a design that lent for ease-of-tuning. Performance was enhanced by the relatively light bike weight of 425 pounds.. not much more than the traditional British twins of the same year, and well below the vaunted Vincent Black Shadow (500 lbs). 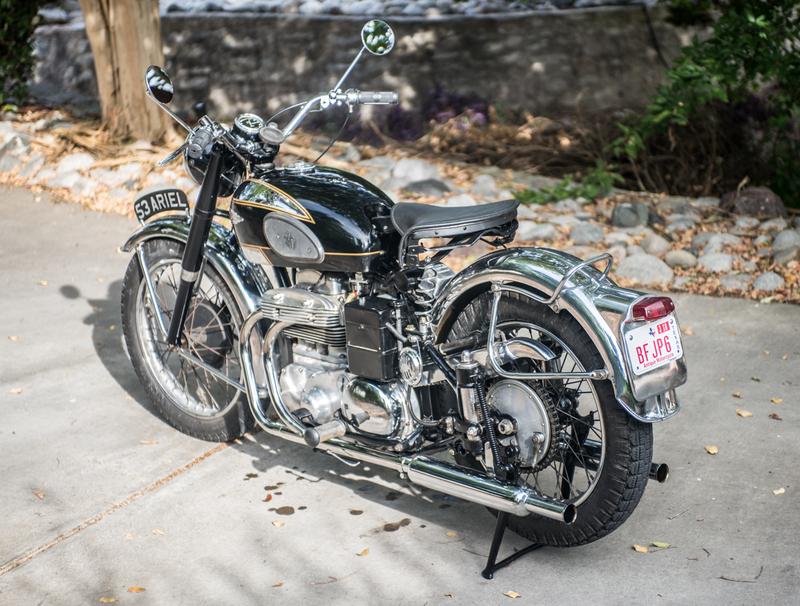 A separate Burman 4-speed transmission (the basic standard for British bikes of the time) provided all the gear ratios needed, with very smooth shifting action. Also somewhat unconventional was use of an automotive-style 4-plug distributor, externally accessed for each of tuning the ignition system. A 6-volt electrical system with generator supplied just enough voltage to power the headlight (as long as the driver kept the revs up!). Finding an Ariel Square Four in the US isn’t an easy task. Rarely does one appear on eBay, and when discovered either they command serious 5 figure prices, or consist of little more than a collection of parts in a box that some owner thinks is worth big bucks. After much patient searching, I finally found my bike for sale by an owner on the East Coast, and purchased it sight unseen. 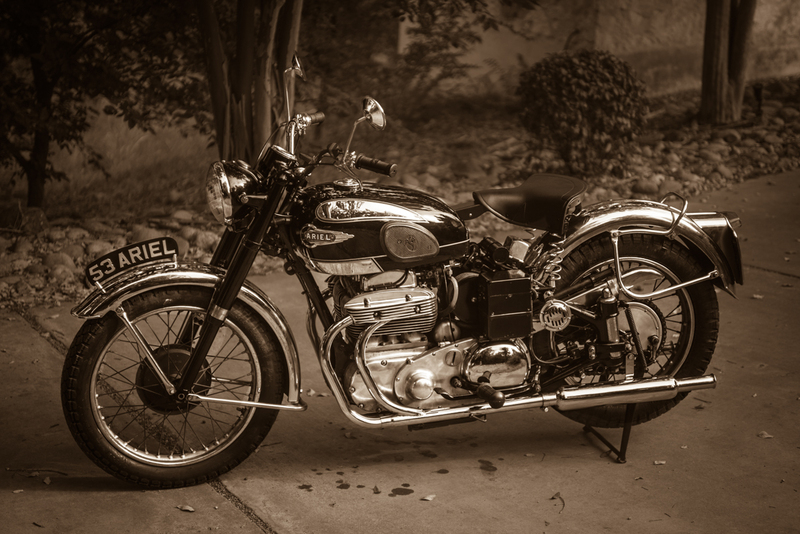 My bike is a 1953 model “Mark II”. 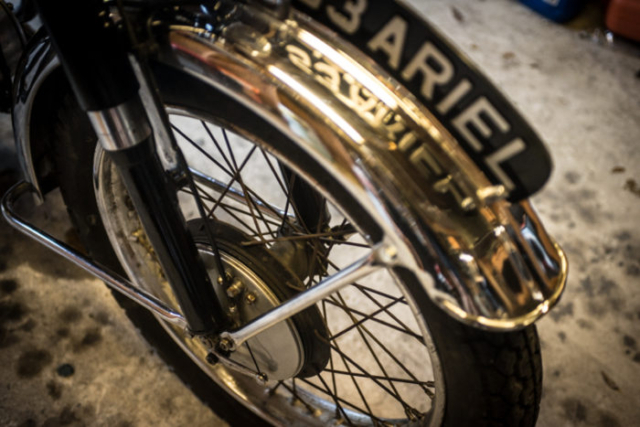 It was the first year to have the 4 separate exhaust pipes exiting the head, which is a beautiful, graceful design. The bike arrived in mid-driver-quality condition, much as the photos had represented. 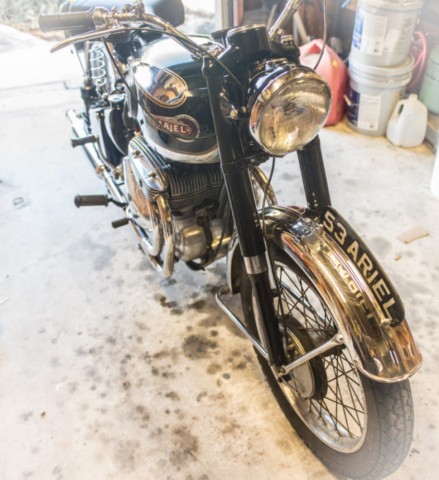 According to the seller, the bike had been “overhauled” back in the ’90’s, and then purportedly had been ridden less than 2,000 miles since, and had been dormant for “several” years. When the bike appeared at my gate, I wasted no time removing the tank and flushing it, cleaning the carburetor, and checking/adjusting valve clearances. After those minor tasks, to my great surprise and pleasure, the bike cranked right up after a short kicking session (no electric starter on this baby). I had the opportunity for several pleasant short rides on this great bike, and it is a joy to ride. However, an ominous cloud was growing overhead. 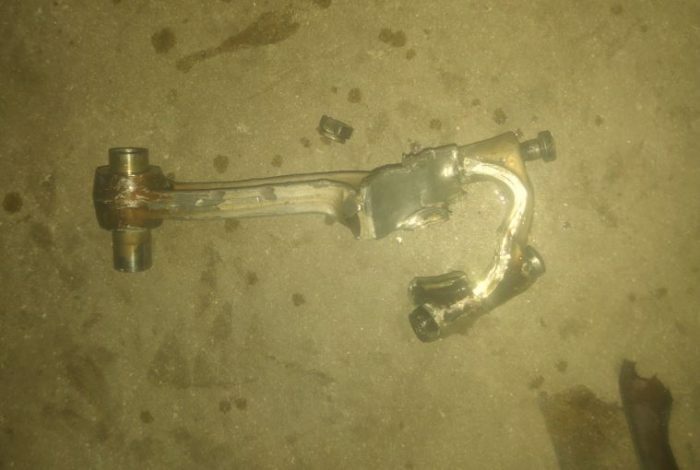 Virtually everything I had read about the bikes included a caution that the oilway passages in the crankshaft are prone to clogging up, which can result in loss of oil to the connecting rods and frequent significant damage to the engine. When I posted news of my acquisition on the UK Ariel owners forum, a number of members cautioned me about operating the bike without first disassembling the engine and making sure those passages were clear. But, in my unbridled optimism, and armed with the seller’s assertion he had overhauled the engine just a few miles ago, I chose to ignore those warnings. Sure enough, Karma reared its ugly head when, on my “final” ride, the engine developed a slight knocking sound, which grew louder as I rode my way back to my house. Foolishly, I pressed on, until suddenly, as I should have suspected, a loud “Clunk” followed by complete lock up of the engine. Drat! When these sort of things happen to me (no this isn’t my first rodeo), I usually just have to submerge myself in a blue funk for a few days before I can move forward, and that was certainly the case with this “incident”. After my partial emotional meltdown, the bike found its way to my shop, and I began the long journey toward recovery. 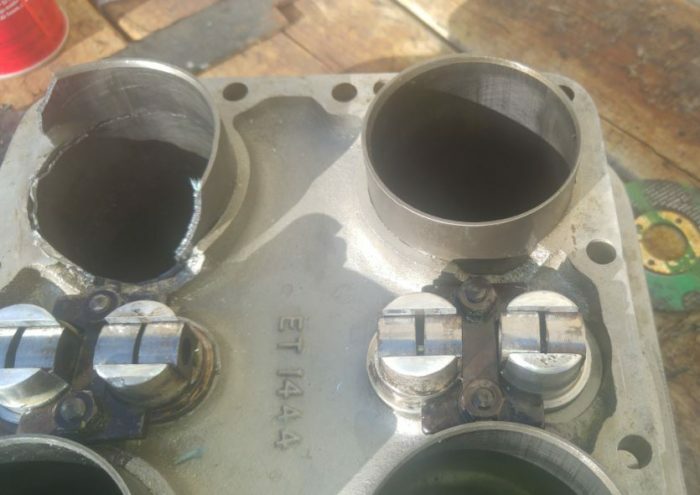 This revealed that the cylinder liner associated with the offending rod had been broken from its lower protrusion (upper left hand cylinder above). Additionally, I discovered that the rod had put a slight crack in the lower crankcase, which will require aluminum welding, and the one crankshaft journal was scored a bit, requiring a regrind. Most interesting, though, was discovering that this engine had ALREADY suffered at least one catastrophic event in its past (most likely in the hands of the seller, who conveniently neglected to advise me), as there was clear evidence of lower case repair from previous damage. 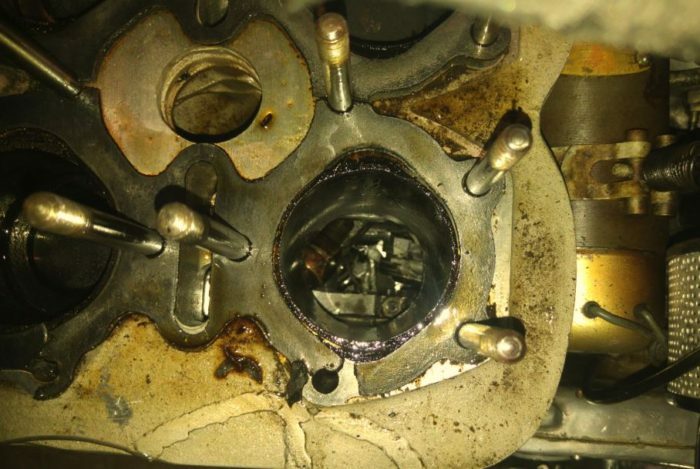 One expert opines that 60% of all Ariel engines have suffered this fate at one time or another in their life! The bright side of this episode (if any exists), is the engine is now in the hands of my able machinist, Jeff Winn, Texas Engine Machine in Llano, and everything looks repairable. This gives me the opportunity to go completely through the bike and engine. The engine will get new pistons, rings, rods, bearings, valves, valve guides, springs, keepers, etc.. most importantly, Jeff will do his magic on cleaning those crankshaft oil galleys. I also have an after market high capacity oil pump as well as accessory oil filter kit to install. This gives me time to lace the brand new stainless wheel rims and spokes, and install the new wiring harness I have in hand. 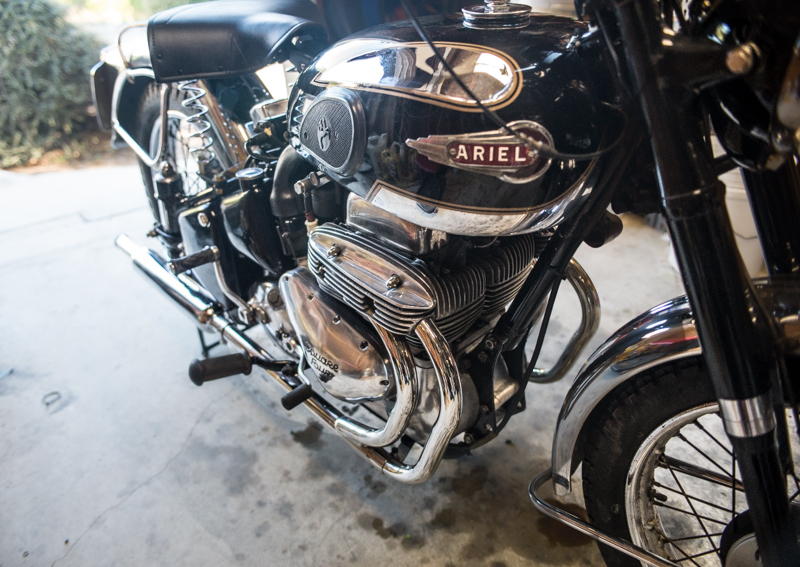 back 1955 i rode a 74 Harley davidson(what else), and agood friend of mine bought a NEW Ariel SQ.4, nice smooth machine! we often rode together, having the usual fun of 1955 summer! we made some plans for a next weekend ride, he called me and said Cancel bike motor went down, thru a rod or something. put in shop and that ended 1955 season for him, came winter he sold it for cheap money! BOY HOW TIMES CHANGE, not the bikes but the cost of them! like this true story, that winter,talking with the bike guys, a REAL Vincent Rapide 1000cc basket case came up for sale. it was in the basement of this old tenement house, went and looked at it, asked “how much” said things were tough, would take $150.dollars, probably was worth it(LOL,LOL). NAH!! stuck to my old Harley 74, never was beat by any furin bike, HEY it could peg the speedo 110mph,and keep pulling, till we run outta road, tough old oil leaker! also had a 1952 Triumph 650 Thunder bird(sprung hub developed bad case of hemroids). speed wise that old clickity click Smith would go exactly 105mph,and hold it, but not one mph more! back around that era , the BEEZZAHs 650 was pretty good. seems nobody had any Nortons to race. all i can say today is i was there ,young ,dumb, and full of c#%m. Boston Mass.